When you think of online dramas, Stardew Valley may not be the first thing to pop into your head, granted, but an argument about animal welfare has seemingly split the game’s community. If you’ve played Stardew Valley, you’ve no doubt visited Pierre’s General Store, where purple-haired Abigail lives and works with her parents. Secreted away in the girl’s bedroom is an animal welfare issue of such concern to player Buffy_B, they contacted the game’s creator, Eric Barone, to demand change. For more small studio brilliance, check our list of the best indie games. They then detail the three things Abigail is doing incorrectly: having lone guinea pigs when they’re “herd animals,” housing them in an incorrect cage, and putting a wheel in its habitat. 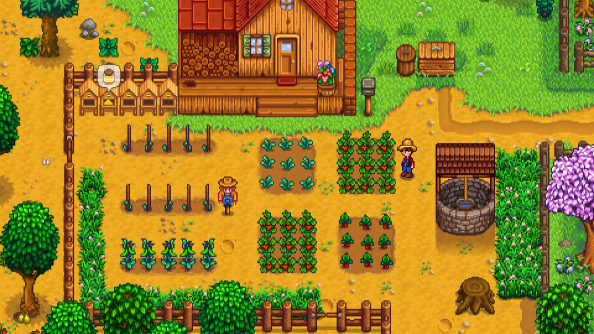 “I am hoping Chucklefish and ConcernedApe may make this change to teach people how guinea pigs should be treated,” they add. If you didn’t know, Mojang recently received a similar request to stop players feeding in-game parrots chocolate chip cookies in Minecraft. The developers hadn’t known chocolate is poisonous to parrots, and some players were concerned that kids playing the game would mistakenly think it’s okay to feed real parrots choc chip cookies, too. But whereas that thread was celebrated, Buffy_B’s request hasn’t been met with such positivity, despite hundreds of upvotes. In an email to PC Gamer, creator Eric Barone admitted he hadn’t thought much about it when putting David the guinea pig into the game. As for whether or not Barone will make the change? Well, he hasn’t decided yet.